CARBONDALE – Artist Jimmy Wright, who earned a master of fine arts degree from Southern Illinois University Carbondale in 1971, is providing a $1 million gift to fully fund fellowships for graduate students in art at SIU. 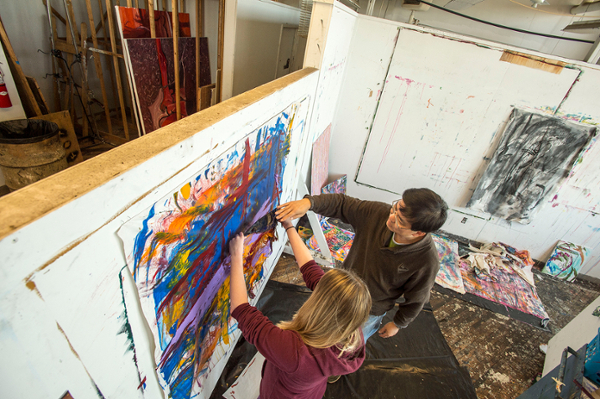 The Jimmy Wright Fine Arts Fellowship endowment, announced by SIU Chancellor Carlo Montemagno, will assist graduate students who need financial support as they pursue their graduate studies in art. Such a gift mirrors Wright’s experience at SIU. A dean’s fellowship provided Wright with the additional financial assistance he needed to complete his degree. He also received other important help along the way, including art department research and teaching fellowships. Wright left SIU to teach in New York State in 1973. Moving to New York City in 1974, today he is an accomplished oil and pastel artist and is represented by the DC Moore Gallery in New York City and Corbett vs. Dempsey in Chicago. His works hang in many public and private collections, including the Metropolitan Museum of Art, the Whitney Museum of American Art and the Art Institute of Chicago. Wright is also a member of the 1910 Society at Ox-Bow, the School of the Art Institute’s summer home in Saugatuck, Michigan, where he has served as a guest faculty member for eleven years. The estate gift, which was made as part of the Forever SIU fundraising campaign, furthers the university’s mission of providing the best experience for students across disciplines, including the arts and humanities. For more information about the campaign, visit www.foreversiu.org. To learn more about Wright and his work, visit www.jimmywrightartist.com, http://www.corbettvsdempsey.com/artists/jimmy-wright/, http://www.dcmooregallery.com/artists/jimmy-wright.